San Diego based indie rock band Goodnight Caulfield will release a new EP titled, Taking Shape, produced by Erik Ron (Panic! at The Disco, D.R.U.G.S., Good Charlotte) on May 3. Goodnight Caulfield’s name is in reference to Holden Caulfield of the best-selling novel, The Catcher in the Rye. The band is bidding adieu to Caulfield’s style of rebellious pessimism and negativity in order to welcome something more positive – something they hope their music brings to people. Goodnight Caulfield was created in late 2006 when best friends’ guitarist/vocalist Adam Cuadra and lead guitarist Joey Meza got together and started creating music. They enlisted the aid of drummer Matt Clemens who wowed them with an ear-shattering drum solo, and their newest member Brian Disney. The group released their debut self-titled EP in early 2008. With influences such as Anberlin, Armor for Sleep and Paramore, the EP was filled with alt rock melodies. Like their contemporaries, their music is highly energetic and upbeat with positive, forward-thinking lyrics to match. 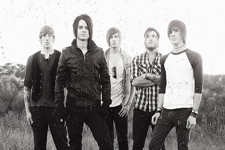 In 2010, Goodnight Caulfield signed with Restless Management, hit the road with Epitaph recording artists The Higher, and recorded their EP Taking Shapes with producer Erik Ron (Panic! at The Disco, D.R.U.G.S., Good Charlotte). With a busy past and an even busier future, Goodnight Caulfield shows no signs of slowing down.